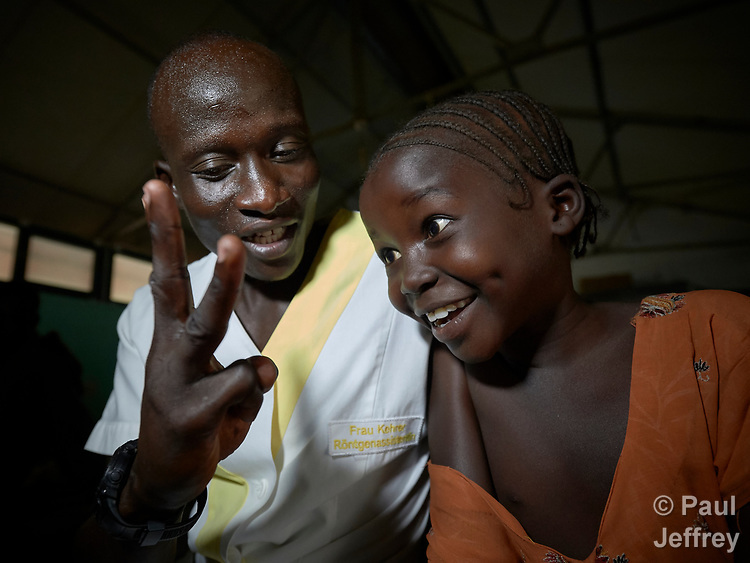 Nurse Isaac Langurry interacts with a young girl wrestling with blindness in the pediatric ward of the Mother of Mercy Hospital in Gidel, a village in the Nuba Mountains of Sudan. The area is controlled by the Sudan People's Liberation Movement-North, and frequently attacked by the military of Sudan. The Catholic hospital is the only referral hospital in the war-torn area. Langurry is a 2017 graduate of the Catholic Health Training Institute, a school in Wau, South Sudan, sponsored by Solidarity with South Sudan.